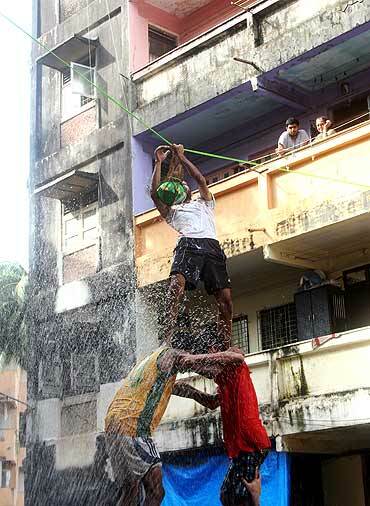 The dahi handi celebrations in Mumbai are, undoubtedly, huge. It is common to see people of different faiths intermingle during the exercise where human pyramids stretch as high as nine levels to break the coveted pot. But it was quite unusual to see Parsis (Zoroastrians) celebrating the festival in Mahim, a Mumbai suburb. It was sort of a first. The scene was picture perfect: A bunch of 10 to 12 young enthusiasts, being egged by the elders lined up outside the common verandah, were frolicking even as small children poured water from pipes. 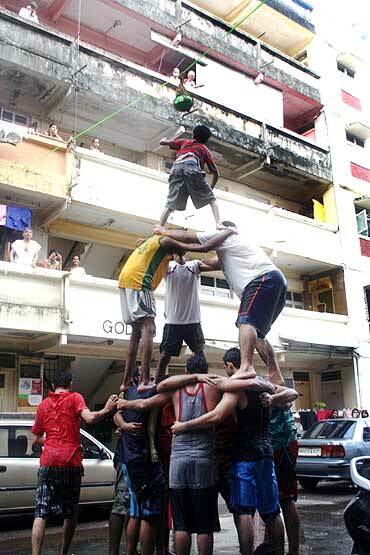 In mock fashion these govindas at the Parsi colony (people, mostly youth, who form the human pyramid are lovingly called as govindas in Mumbai) try to form a three-tier pyramid to break the pot that is filled with curd, turmeric, milk, honey, vermillion etc. In another moment all come crashing down as those that form the base of this pyramid think they are not yet done with their merry-making. They all come down in a heap. Thankfully, the people who are at the base know what they are doing and let the tier above them fall on them. "We represent India's youth. We want to break this stereotypical image that people have about Parsis in India. Movies always depict old people wearing traditional Parsi clothes. There is more to Parsis than old people," says an enthusiast who was part of the troupe that formed the base of the human pyramid here. The effort to form the required three-tiers begins again. Loud govinda songs playing from a car stereo blare popular govinda songs. The merry-making starts afresh. Girls, women, old men egg the govindas to go get it. The zealous crowd sets the pulse. Six strong govindas gather again under the pot forming the base. Three more climb atop this base. They all stand up. A small kid, aged 8, makes his moves. Climbs the two tiers with ease but just as he is about to cling to the pot the base pyramid breaks again. If you were to close your eyes and imagine the goings-on, it would be very difficlut to fathom that you are standing inside a Parsi locality. This time everybody's serious. They want to break the pot this time and they do so with much ease. Only this time a young boy of 18 climbs atop the two tiers and breaks the pot in a flourish. Job done everybody claps. 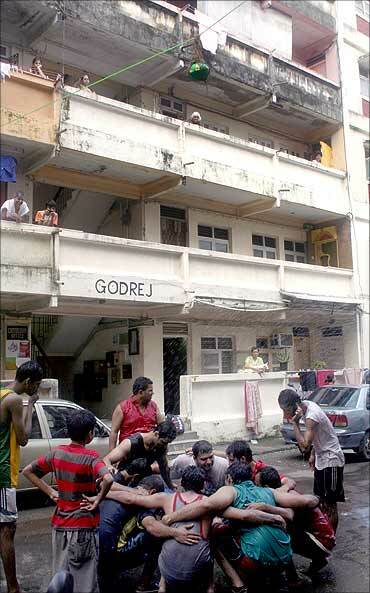 The Janmashtami celebrations at the Parsi colony are over.